I hope you’ve all had an amazing 2017 thus far and let’s finish strong with something seasonal. The Christmas Tree Cluster (also called Christmas Tree Nebula) is cataloged by the cluster NGC 2264 which is embedded in this diffuse nebula, roughly 3,000 light years away in the winter constellation of Monoceros. This region is beautiful and just full of objects to observe and it’s appropriately named because it’s loaded with color and you don’t have to stretch those egg nog induced imaginations too far to see the Christmas tree shape to the overall structure. This image spans three quarters of a degree or about 1.5 full moon widths and stretches about 40 light years in length. There are roughly (everything’s roughly) 40 stars that, with the help of the nebula, form a pretty well defined tree shape and many of these stars you can see without any optical aid at all. The naked eye visible 6th magnitude star HD 47887 sits just above the top of the tree, near the Cone nebula (the Cone nebula pretty much points at it) while S-Mon or 15 Monocerotis at magnitude 4.5, is the brightest star in the cluster and sits at the base of the cluster. Within this region of gas, dust and newborn stars are a few other notable locations such as the Fox Fur Nebula and the Cone Nebula (mentioned above) which we will detail next. NOTE: NGC 2264 also includes the Cone Nebula, not just the open star cluster. Let’s continue on with our Christmas Tree Cluster zoom. The next stop were going to make in this region is called the Fox Fur Nebula and it’s cataloged as Sharpless2-273 and it’s a region of cosmic gas and dust that’s being excited and deformed by nearby star cluster NGC 2264 which you can see in this image just to the right of the fox. That extremely bright star in the cluster (right of the fox) is S Monocerotis or S Mon for short. It’s a massive magnitude 4.5 star that is 8,500 times more luminous than the Sun and it, along with its cluster buddies shower the region with ultraviolet radiation as their ultimate goal is to clear the area and create an unabated view of the universe around them. That stellar wind excites the area, ionizes the hydrogen gas atoms and renders it aglow in the incredible pink-purple colors while the blue is likely from the starlight itself refracting off the gas and dust particles throughout the area. Like the Christmas Tree Cluster, you don’t have to use up much of your imagination trying to understand where this region gained its name. The flowing look that this cloud demonstrates really does resemble a fox or fox stole. You can easily see the head, ears and pointy nose as well as even a left leg. Again, this entire region is spectacular when imaged. Through the eyepiece, not so much as the stars are easily observable but it takes BIG aperture to find any nebulous detail with your own eyes. 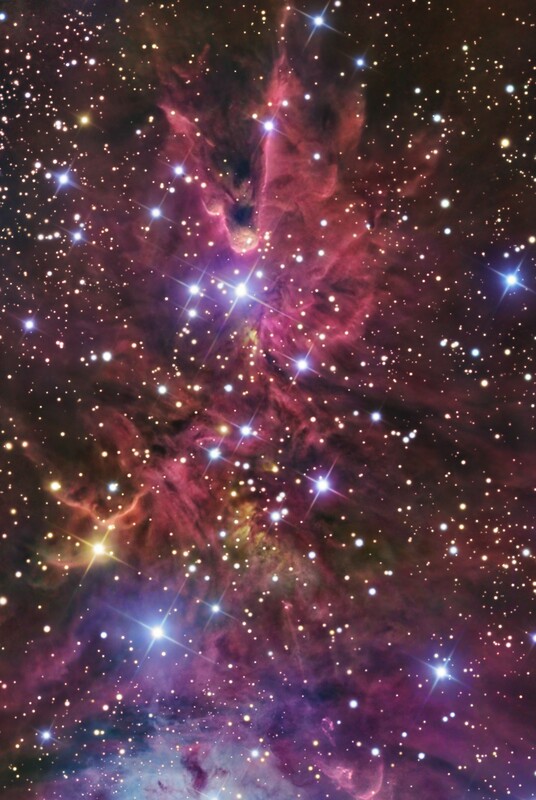 We’re on to the final installment of the Cosmic Christmas Tree zoom and on this stop we’re going to detail the most famous structure in this region; the Cone Nebula. The cone sits at the top of the Christmas Tree (southern end) pointing downward and like the rest of the region it’s about 2700 to 3000 light years away in the constellation Monoceros. That’s just to the side of Orion and between the two dogs, Canis Major and Minor as we see them on the night sky. The cone is a conical (go figure) tower of dark absorption nebula which is comprised of cold molecular hydrogen. That mass of material blocks our view of the red colored emission nebula behind it just like in the Horse Head or Pillars of Creation nebulae. Regions like these are known to be stellar incubators and tend to have many forming stars within them. The only notable star nearby that’s not S Mon is the bright star HD 47887 which is just off of the top of the cone itself. Again, like the rest of this region, viewing the stars in the cluster are fairly easy but seeing any nebulosity will be a challenge for sure. BIG aperture (I’d venture to say 10” or more), dark skies with your eyes dark adapted and averted vision will be your friends if you attempt to nab this structure with your own eyes. 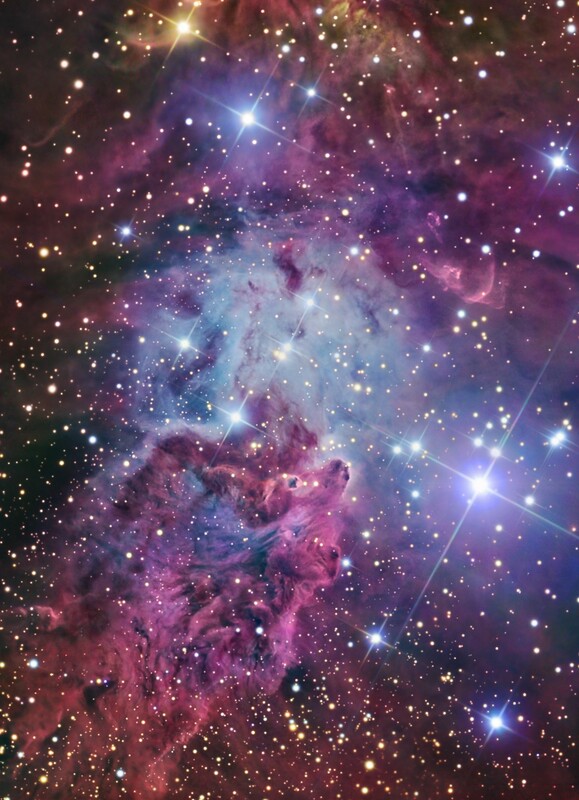 Name: NGC 2264, Christmas Tree Cluster, Snowflake Cluster, Fox Fur nebula, Sh2-273, Cone Nebula, NGC 2661, Hubble’s Variable Nebula. What is it? : Open star cluster and emission nebula. How big is it? : The Christmas tree region is about 40 light years in diameter. How far away is it? : Roughly 3000 light years away. Discovery and naming: William Herschel in 1784 and named by L.S. Copeland. Apparent magnitude: The open star cluster is about +4.5. Where is it? (General): Constellation Monoceros (The Unicorn). Where is it? (Exact RA/Dec J2000): Star S-Mon RA 06h 40m 58.66s / DEC +09° 53′ 44.715″. 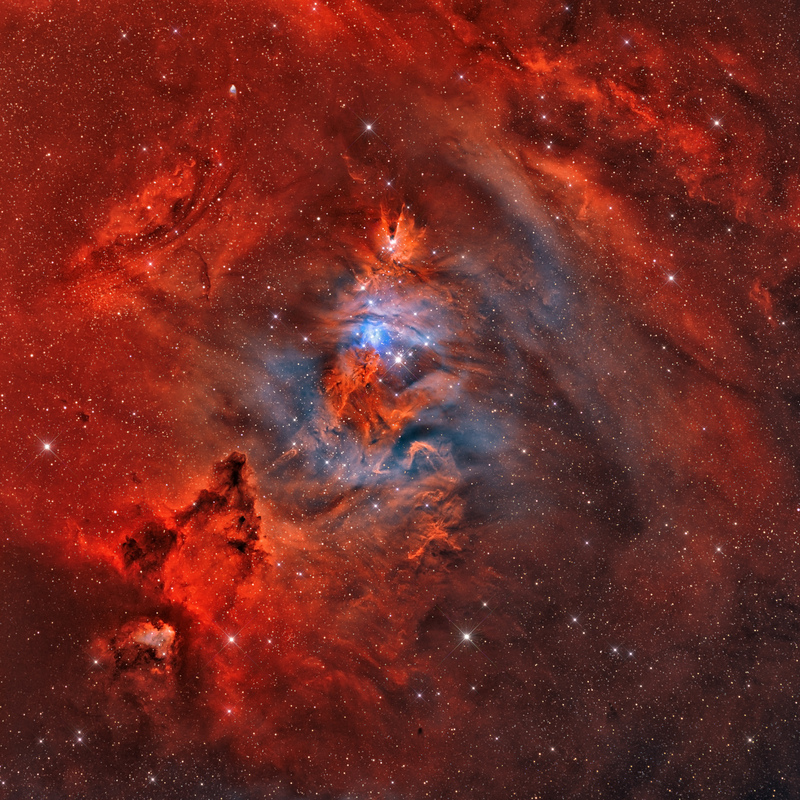 Image | This entry was posted in Astronomy (Learning), Astrophotography (DSOs), Images, Nebula (Emission, Reflection), Star Clusters (Globular-Open) and tagged Astronomy, Astrophotography, Christmas Tree, Christmas Tree Cluster, Christmas Tree Nebula, DanSpace77, Space. Bookmark the permalink.